At the end of his workday spent crunching numbers at his office in downtown Bangor, accountant Greg Edwards wants to go home, just like most people. But unlike most Mainers, he doesn’t get there by hopping in a car and speeding away. Instead, as the light fades on a chilly January afternoon, he carefully buckles on a helmet, dons his L.L. Bean boots and heads to the basement. 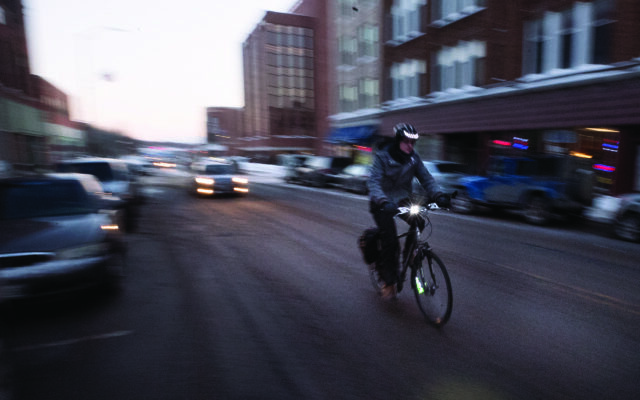 There, he checks the batteries on the lights that allow motorists to see him coming and hits the road on a workhorse of a bicycle that carries him around in rain or shine, snow or ice. In the winter, he tricks out his bike with studded snow tires, and sometimes has to don a balaclava and ski goggles if the temperature dips below 20 degrees Fahrenheit. But otherwise, winter or summer, the bike and his own muscles get him up State Street hill and then home, which is located not too far from Eastern Maine Medical Center. To read this article in full, pick up the March/April issue of Bangor Metro available now! Click here for a full list of where to find Bangor Metro on newsstands or better yet – click here to subscribe and get Bangor Metro delivered to your door!